The Cambrian Period marks an important point in the history of life on Earth; it is the time when most of the major groups of animals first appear in the fossil record. This event is sometimes called the "Cambrian Explosion," because of the relatively short time over which this diversity of forms appears. It was once thought that Cambrian rocks contained the first and oldest fossil animals, but these are now found in the earlier Ediacaran (Vendian) strata. Almost every metazoan phylum with hard parts, and many that lack hard parts, made its first appearance in the Cambrian. The only modern phylum with an adequate fossil record to appear after the Cambrian was the phylum Bryozoa, which is not known before the early Ordovician. A few mineralized animal fossils, including sponge spicules and probable worm tubes, are known from the Ediacaran Period immediately preceding the Cambrian. Some of the odd fossils of the biota from the Ediacaran may also have been animals representative of living phyla, although this remains a somewhat controversial topic. However, the Cambrian was nonetheless a time of great evolutionary innovation, with many major groups of organisms appearing within a span of only forty million years. Trace fossils made by animals also show increased diversity in Cambrian rocks, showing that the animals of the Cambrian were developing new ecological niches and strategies  such as active hunting, burrowing deeply into sediment, and making complex branching burrows. Finally, the Cambrian saw the appearance and/or diversification of mineralized algae of various types, such as the coralline red algae and the dasyclad green algae. This does not mean that life in the Cambrian seas would have been perfectly familiar to a modern-day SCUBA diver! Although almost all of the living marine phyla were present, most were represented by classes that have since gone extinct or faded in importance. For example, the Brachiopoda was present, but greatest diversity was shown by inarticulate brachiopods (like the one pictured below, left). The articulate brachiopods, which would dominate the marine environment in the later Paleozoic, were still relatively rare and not especially diverse. Cambrian echinoderms were predominantly unfamiliar and strange-looking types such as early edrioasteroids, eocrinoids, and helicoplacoids. The more familiar starfish, brittle stars, and sea urchins had not yet evolved, and there is some controversy over whether crinoids (sea lilies) were present or not. Even if present, crinoids were rare in the Cambrian, although they became numerous and diverse through the later Paleozoic. And while jawless vertebrates were present in the Cambrian, it was not until the Ordovician that armored fish became common enough to leave a rich fossil record. Left: Acrothele, a fairly common inarticulate brachiopod from the the Wheeler Shale of western Utah. 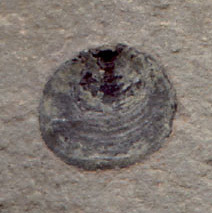 Middle: Olenellus fremontii from the Latham Shale of southern California. Right: A hyolith, also from the Latham Shale. 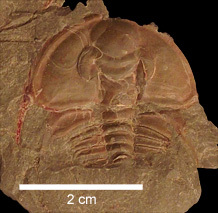 Other dominant Cambrian invertebrates with hard parts were trilobites (like the one pictured above), archaeocyathids (relatives of sponges that were restricted to the Lower Cambrian), and problematic conical fossils known as hyolithids (like the one pictured above, right). Many Early Cambrian invertebrates are known only from "small shelly fossils"  tiny plates, scales, spines, tubes, and so on. Many of these were probably pieces of the skeletons of larger animals. A few localities around the world that preserve soft-bodied fossils of the Cambrian show that the "Cambrian radiation" generated many unusual forms not easily comparable with anything today. The best-known of these sites is the legendary Burgess Shale (middle Cambrian) in the British Columbian Rocky Mountains. Sites in Utah, southern China, Siberia, and north Greenland are also noted for their unusually good preservation of non-mineralized fossils from the Cambrian. One of these "weird wonders", first documented from the Burgess Shale, is Wiwaxia, depicted at lower left. Wiwaxia was an inch-long, creeping, scaly and spiny bottom dweller that may have been a relative of the molluscs, the annelids, or possibly an extinct animal group that combined features of both phyla. A lot can happen in 40 million years, the approximate length of the Cambrian Period. Animals showed dramatic diversification during this period of Earth's history. This has been called the "Cambrian Explosion". When the fossil record is scrutinized closely, it turns out that the fastest growth in the number of major new animal groups took place during the as-yet-unnamed second and third stages (generally known as the Tommotian and Atdabanian stages) of the early Cambrian, a period of about 13 million years. In that time, the first undoubted fossil annelids, arthropods, brachiopods, echinoderms, molluscs, onychophorans, poriferans, and priapulids show up in rocks all over the world. Stratigraphic boundaries are generally determined by the occurences of fossils. 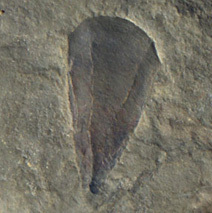 For instance, the trace fossil Treptichnus pedum marks the base of the Cambrian. This boundary is an unusual case, since stratigraphic boundaries are normally defined by the presence or absence of groups of fossils, called assemblages. In fact, much paleontological work is concerned with questions surrounding when and where stratigraphic boundaries should be defined. At first glance, this may not seem like important work, but consider this: if you wanted to know about the evolution of life on Earth, you would need a fairly accurate timeline. Questions such as: "how long did something stay the same?" or,"how fast did it change?" can only be assessed in the context of time. World climates were mild; there was no glaciation. Landmasses were scattered as a result of the fragmentation of the supercontinent Rodinia that had existed in the late Proterozoic. Most of North America lay in warm southern tropical and temperate latitudes, which supported the growth of extensive shallow-water archaeocyathid reefs all through the early Cambrian. Siberia, which also supported abundant reefs, was a separate continent due east of North America. Baltica  what is now Scandinavia, eastern Europe, and European Russia  lay to the south. Most of the rest of the continents were joined together in the supercontinent Gondwana, depicted on the right side of the map; South America, Africa, Antarctica, India, and Australia are all visible. What is now China and east Asia was fragmented at the time, with the fragments visible north and west of Australia. Western Europe was also in pieces, with most of them lying northwest of what is now the north African coastline. The present-day southeastern United States are visible wedged between South America and Africa; they did not become part of North America for another 300 million years. Tectonism affected regions of Gondwana, primarily in what are now Australia, Antarctica, and Argentina. The continental plate movement and collisions during this period generated pressure and heat, resulting in the folding, faulting, and crumpling of rock and the formation of large mountain ranges. The Cambrian world was bracketed between two ice ages, one during the late Proterozoic and the other during the Ordovician. During these ice ages, the decrease in global temperature led to mass extinctions. Cooler conditions eliminated many warm water species, and glaciation lowered global sea level. However, during the Cambrian there was no significant ice formation. None of the continents were located at the poles so land temperatures remained mild. In fact, global climate was probably warmer and more uniform than it is today. With the retreat of Proterozoic ice, the sea level rose significantly. Lowland areas such as Baltica were flooded and much of the world was covered by epeiric seas. This event opened up new habitats where marine invertebrates, such as trilobites, radiated and flourished. Plants had not yet evolved, and the terrestrial world was devoid of vegetation and inhospitable to life as we know it. Photosynthesis and primary production were the monopoly of bacteria and algal protists that populated the world's shallow seas. Also during the Cambrian, the oceans became oxygenated. Although there was plentiful atmospheric oxygen by the beginning of the period, it wasn't until the Cambrian that there was a sufficient reduction in the number of oxygen-depleting bacteria to permit higher oxygen levels in the waters. This dissolved oxygen may have triggered the "Cambrian Explosion"  when most of the major groups of animals, especially those with hard shells, first appeared in the fossil record. Aldan River, Siberia,: This early Cambrian fauna tells us about the early evolution of animals with skeletons. Burgess Shale, British Columbia: Thousands of soft-bodied animal fossils paint us a picture of early marine life. House Range, Utah: An array of Cambrian critters has been found in the Wheeler Shale and the Marjum Formation. Marble Mountains, California: Olenellid trilobites and more are found in this Mojave Desert locality. White-Inyo Mountains, California: Visit ancient Cambrian reefs in these mountains of eastern California. See the Wikipedia page on the Cambrian.